The weather today is not great - rain showers througout the day. So I cranked up my kitchen oven with a baking steel and used the last two balls of dough. 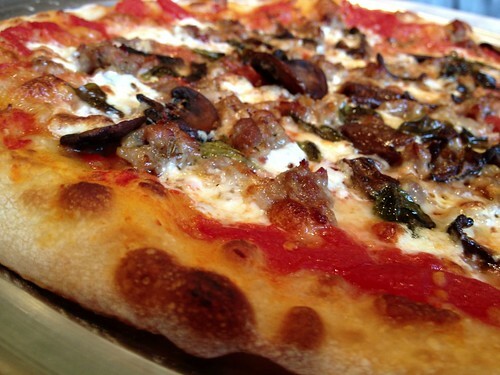 The first was lunch, with leftover toppings from Friday night, namely San Marzanos, fiore di latte and shredded mozzarella, crumbled sausage, sauteed wild mushrooms, basil, and a drizzle of Tuscan olive oil. 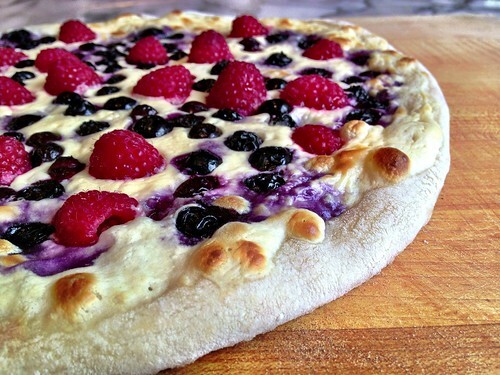 I made a Berry Cheesecake pizza with the other ball of dough. We're going to a freind's for dinner and this will be my contribution for dessert. I've never made this before and I know I probably shouldn't bring an experiment, but they're my oldest, closest friends so I can't do much damage. I would have preferred a darker bake but I didn't want to incinerate the berries. 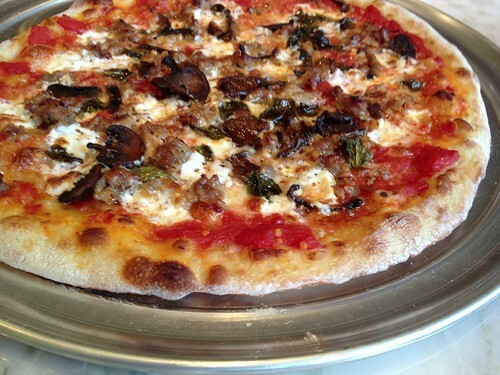 Your other pizza looks terrific and has to taste great. You're very kind. I don't know about mastery, but I've certainly improved over many years of trying to achieve a great pizza at home. I'm happy to share my method for using the pizza steel. I place the baking steel in the upper middle part of the oven, about 6-8 inches from the broiler, and heat for a good hour at as a high a temperature as my oven will go (550F). About five minutes before baking the first pizza, I switch the oven from bake to broil and super-heat the surface of the steel. Switch the oven back to bake and load the pizza. After about five minutes of baking, I turn the pizza to evenly cook the crust. When the bottom of the crust is just about done and nicely speckled with brown spots, I switch the oven back to broil. At this point you have to watch the pizza closely because it goes quick. When the cheese is bubbling and starting to brown in spots, it's done. Good luck and please post your results. Dessert pizza has been on my to-do list for years but I have never actually done it. Yours looks amazing! Very encouraging! The dessert pizza was pretty good. The berries weren't all that sweet so next time I'll add a bit more sugar to the cheesecake batter. I took the advice offered by dabrownman and reheated it before serving which did add some caramelization to the crust.